The 100th running of this all-time classic started with a mix of former champions, relative newcomers, and Indy 500 specialists making up the first three rows. Row 1: James Hinchcliffe (#5 Schmidt Peterson Motorsports, Honda), Josef Newgarden (#21 Ed Carpenter Racing, Chevy), and Ryan Hunter-Reay (#28 Andretti Autosport, Honda). Row 2: Townsend Bell (#29 Andretti), Carlos Munoz (#26 Andretti), and Will Power (#12 Team Penske, Chevy). Row 3: Mikhail Aleshin (#7 Schmidt Peterson), season points-leader Simon Pagenaud (#22 Penske), and three-time Indy 500 winner Helio Castroneves (#3 Penske). Hunter-Reay passed Hinchcliffe in Turn 3, Lap 1 to take the lead. Hinchcliffe retook the spot in Lap 3, with Hunter-Reay coming back the next lap. The two continued to trade the point through the early laps, Bell running in third. The two leaders pitted for the first time during Lap 29, Hinchcliffe’s stop running long. Hunter-Reay ran first once the cycle was complete, with Newgarden in second and Bell third. Bell took the lead during Lap 42. The caution flew a few laps later for debris in Turn 2 and the whole field pitted, Hunter-Reay coming out in front of Pagenaud and Bell. Racing resumed to start Lap 55 (of 200). Bell retook the lead two laps later, with he and Hunter-Reay swapping the spot in subsequent laps. Hinchcliffe moved to the front during Lap 59. Hunter-Reay jumped him in 61. The yellow flag came out three laps later as last year’s winner, Juan Pablo Montoya, crashed out in Turn 2. Most of the field pitted. Hinchcliffe returned to the track in front of Hunter-Reay and Castroneves, with Power, who had stayed out, taking the lead. Hinchcliffe retook the lead on the Lap-75 restart, with Hunter-Reay moving to front three laps later and swapping it back and forth with the Canadian. Castroneves took the lead in the Lap 90, with Hinchcliffe retaking it two laps later. The two started swapping it back and forth. Castroneves was on point in Lap 94 when Sage Karam crashed out working his way through the field. Many of the competitors, including Castroneves, pitted. Castroneves, Hunter-Reay, and Hinchcliffe exited the pits in that order. Hunter-Reay retook the lead when action resumed to start Lap 106, swapping it with Castroneves. Tony Kanaan (#10 Chip Ganassi Racing, Chevy) moved to the front in Lap 109, Hunter-Reay overtaking him the next lap. Bell moved to the front during 113. Aleshin spun and hit the wall, with Conor Daly spinning while trying to avoid him and also crashing, to bring out the fourth caution. Much of the field pitted. Bell and Hunter-Reay collided trying to leave the pits. Alex Tagliani (#35 AJ Foyt Racing, Honda), who started last, and Alexander Rossi (#98 Andretti Herta Autosport, Honda) both stayed on track to move to the front, with Castroneves exiting pit row first to slot in third. Rossi moved to the front on the Lap-122 restart, Tagliani retaking the point two laps later. The two swapped it back and forth, Kanaan running third. Castroneves took the lead in Lap 139 when Rossi pitted. The leaders came in during Lap 150. Munoz assumed the lead and a caution flew for a loose tire coming off pit road. Munoz pitted from the lead under the caution, but those who had already pitted moved to the front: Castroneves, Kanaan, and Newgarden. Kanaan moved to the front when racing resumed on Lap 159, he and Newgarden swapping the spot. Hinchcliffe took the lead in 161. Takuma Sato hit the wall during Lap 163, bringing out a caution while Castroneves was in danger of being black-flagged for loose body work. Kanaan returned to the lead. The leaders all pitted. J.R. Hildebrand (#6, Ed Carpenter) stayed on track to take the top spot, followed by Tagliani, and a first-out Hinchcliffe. Kanaan retook the point with 33 laps left. Rossi, however, stretched his last tank of fuel over the final 36 laps, running dry as he entered Turn 4 of the final lap with enough momentum to carry him across the finish line 4.4975 sec ahead of teammate Carlos Munoz. In the process, Rossi became the 10th rookie in Indianapolis 500 history to win the race and the first since Castroneves in 2001. He became a Verizon IndyCar Series winner in just his sixth race and the first to win a race in his debut season since Carlos Huertas in 2014. "I have no idea how we pulled that off," a stunned Rossi admitted in Victory Circle after drinking and then pouring the celebratory bottle of milk over his head. "We struggled a little bit in the pit stops but Bryan (Herta) came up with an unbelievable strategy. I can't believe we've done this!" 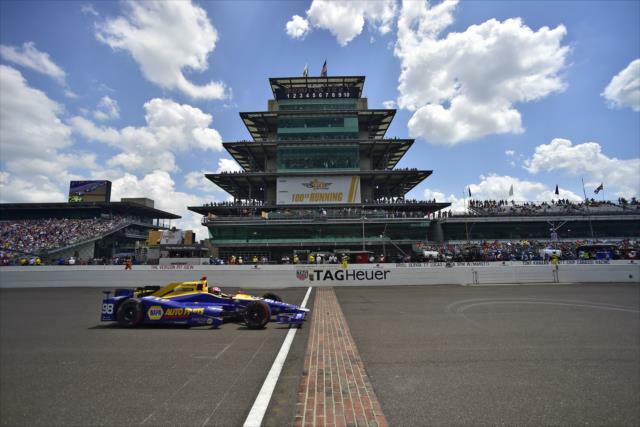 In a race that saw 13 drivers swap the lead 54 times - the second most changes in Indy 500 history (68 in 2013) and seventh most for any Indy car race - Rossi led just 14 laps. The majority of the field, including Rossi, stopped for fuel and tires on Lap 164 during the Sato caution period. Rossi, a reserve Formula 1 driver for Manor, sat seventh on the Lap 167 restart and bided his time as those ahead of him began to peel off for a splash of fuel in the final 10 laps. When race leader Munoz had to stop four laps from the completion of the 200-lap event, Rossi inherited the lead and nursed his car home with help of a tow from another Andretti teammate, Ryan Hunter-Reay. Rossi's final lap averaged 179.784 mph, nearly 40 mph slower than the charging Munoz, but he had cushion enough to coast across the famous yard of bricks by the largest margin of victory since the 1996 race. "I was really disappointed when it comes down to fuel and you lose the race because of that,” said Munoz. “I was really disappointed to get second and be half a lap short. That's what it took. I was sliding the last two stints. I knew I had the car to win in the first half of the race. I just was holding my position. Last part of the race I was pushing really hard, overtaking everyone. One of the yellows didn't help us. We fell back into the field and got back to the front of the field again. It wasn't our day, if I'm honest. My team never was in the fight. But this is racing. We have to congratulate him (Rossi). It's part of the racing, strategy and everything. The only thing I'm clear about is that I want to win this race one day. Man, it was a close one. I think me and Newgarden had the battle for the win, we were so strong. But I'm happy for the team, one and two Andretti, one and two for Honda." "It was a crazy race,” said Newgarden. “Not the way I wanted to finish it. I think we had a shot at outracing these guys today and that's all I wanted was a shot to race him at the end. I didn't feel like I got that but that's no fault of my team. I think we had an amazing car. It's not the way the cards fell today with the fuel that everyone was using and the way the fuel started to break down towards the end and everyone started to see what they had to do. It wasn't a straight shootout. People were doing different strategies and we went for it. We were trimming out. We were doing a normal running and we went flat out, trying to win the thing and when you have a strong a car as we did you have to do that. I mean, it's Indianapolis. We had a shot of winning this thing and the cards didn't fall our way. I'm just happy to be here. Happy to have a shot. Disappointed we weren't able to race for it at the end. Today is gut-wrenching just because I think I had a winning car. And when you know you have a winning car and you know you can win the thing and you go for it and it doesn't happen, you know, because of a strategy call, it's kind of tough. I don't think that's on our guys. We've done exactly what we needed to do. We went flat out, trimmed the thing out, tried to win the thing. I think we could have outraced anyone today at the end if we needed to. That's all I was really asking for. We didn't get that. It's the Indy 500. This is the 100th running. This is a staple, man. This is the greatest race in the world and just to be a part of it has been amazing for me. I just hope I get another shot to try and win this thing again."